I've made sexist remarks. I've jumped to sexist conclusions, or made sexist generalisations, secure in the various axes of my male, white, heterosexual privilege. I’d like to elaborate a bit on my own continuing journey towards identifying and addressing my own prejudices. When you read the phrase “addressing my own prejudices” in the previous paragraph, you probably jumped to a conclusion: that I’m some sort of partially-rehabilitated erstwhile monster, guilty of rampant sexism that was so bad as to cause me to re-evaluate my life. You probably assumed that this article was one of those pieces, where the ex-addict becomes a counsellor for Alcoholics Anonymous: a redemption story. That’s not the case. I have no horror stories to tell you. The aforementioned acknowledgement of the times I’ve been sexist was entirely truthful, but I was never the sort of maladjusted maniac who would shout “bloody women drivers!” out of the car window for all to hear. I’m not blameless, though, and it’s far too easy to write about sexism (or any prejudice) from the safe position of a virtuous arbiter of morality. The problem with prejudice is that it’s perfectly possible to find it abhorrent yet nonetheless also find yourself displaying it. I think we’ve all already agreed that prejudice on the grounds of gender (or race, or sexual orientation, or the long list of other things we discriminate based on) is a bad thing. The debate has ended. Instead of rehashing it, I think it’d be a lot more helpful to take a look at our own experiences and behaviours. I’m happy to go first. I described the process as my continuing journey deliberately; I’m still there. I’m moving forward, but I’m a work in progress. Of course I am. I’m not sure what science’s current opinion is on how much of our macroscopic, society-level behaviour can be attributed to our genes, but my feeling is that I’m mostly a product of my environment. My prejudices are a matter of social nurture, rather than nature. Our culture gave me the tools to bear prejudice, but I’m having to find the tools to eliminate it on my own. I’ve heard people say that if someone is brought up in a sexist society and thus becomes sexist, it’s not their fault. That’s a bit of rhetorical sleight-of-hand. On the surface, it’s true - but it sidesteps the question of continuing responsibility. If the same sexist (or racist, or whatever) person is capable of re-evaluating their own position but does not do so, then they’re responsible. Perhaps not for becoming prejudiced, but for remaining so. It’s difficult to adequately define ‘capability’ in that context, but if you’re reading and comprehending this, I’d say you’re probably capable of self-evaluation. I certainly am. I work in the technology industry, if such a thing exists (the actual technology industry, where I write and debug code, design and build software, and have an education in the field - not the technology-related segments of other professions like tech journalism, or tech marketing, or capital investment for tech). My industry is famous, deservedly or otherwise, for occupying a uniquely ominous Venn intersection regarding sexism: a mathematics-based science subject, with notoriously poorly-socialised practitioners. We’re the industry whose conferences have semi-naked ladies pretending to like the phone they’ve been holding for six hours, and whose job adverts juxtapose “crush” with “code”. We’re absolutely the most macho of the least macho professions in recorded history. The inevitable outcome of pubescent heterosexual male insecurity on a massive scale. Our society is sexist (I’m not bothering to clarify which type: you know that I mean the usual one, which is to say harmfully discriminatory towards women). All human societies are sexist. Many, and perhaps most human societies are even overtly misogynistic. I don’t think that’s still being debated either. We’re brought up that way. Assigning certain characteristics to women, often based on perceived differences from males. “Women are too emotional” and “women are weak” are difference-based assignments of characteristics. Assuming that women are intrinsically less capable than men, in some capacity. This is often based on either an absurd generalisation of flaws from a real or stereotyped individual (“women are bad drivers”), or more subtly on an inability for men to separate the essence of a skill or task from the way in which men perform it. It makes a slippery slope assumption that an entire field of endeavour is predicated on a single characteristic. It ignores the possibility of multiple roles within a profession. It sidesteps the large issue of how current (alleged) optimality for one factor balances against wider social repercussions in the medium and long term. It makes an exceptionally wide and stereotypical generalisation and treats it as fact. It excludes people of a given gender based on a distinction regarding strength, as if the two were equivalent (thus allowing weaker men to fight, but not stronger women). But not everyone is capable of making that analysis. Even some of those who can see those things aren’t willing to then try to internalise them, and thus come to understand and believe that the original statement is flawed. Back to me for a moment. I’m still working on finding and hammering out those nurtured dents and flaws, but that second type of sexism - about capability - feels alien to me. I’ve been guilty of the first, certainly, but I can’t get into the mental model I think you’d need for the second. The reason for that, I think, actually also indicates the way that we can reach those who are either unwilling or unable to rationalise their prejudices: role models. How was your childhood? Answer in fewer than thirty words, please; your hour is almost up. People tend to fall into two camps regarding how they remember their childhood: idyllic, or awful. I remember mine as being both, which is probably closer to the truth for most people. I wrote about some aspects of it a few years ago. Next month, as usual, my mother will hold her annual show. She’s a dance teacher (of the ballet and tap variety), a fellow and examiner of the various dance associations, she has a string of letters after her name, and every June she and her pupils put on a recital, the proceeds of which go to charity. This year is her 47th consecutive year, since she started her own dance school at the age of 16. Next month is also my 34th birthday, which makes the dance show in 1979 all the more impressive in retrospect (I assume she took a purely directorial role for that one since it was only a few weeks after my birth, but I’ve never asked). I was born into a world where my mother had always worked, and always continued to - and where she had a battalion of pupils whose leotards bore her initials. It was also a world where, from about a month before I arrived until after I was ten years old, the Prime Minister of the UK was a woman. All perfectly normal for me. My father worked too, of course. His own upbringing was vastly different from mine. I grew up in a large house, went abroad twice a year on holidays, and attended a fee-paying high school. He grew up in a single-end flat in a tenement in a poor part of Glasgow, with only his father. His mother died when he was young, and his brother lived with their grandmother. He fended for himself, and life wasn’t easy. My father is in the motor trade. In his youth he built trucks, but later he moved to sales, and he’s been selling cars for longer than I’ve been alive. The motor trade is macho in the real sense, and in previous decades was closer to the wild west. Modern (and dare I say European) standards of consumer protection didn’t really apply, and I’ve heard some wonderful, terrible stories. I remember one about a customer, decades ago now, who had financed a car and was late with his final payment. Time went on, reminders were sent, and payment was promised but didn’t arrive. The customer was sitting at home one night, no doubt about to go to bed. The phone rang, and it was the car dealership yet again, which was unusual at such a late hour. The customer was asked to look out of his window, at his beautiful new car - and he did so. His attention was directed to the single brick which had been carefully (and harmlessly) placed on the roof of the car, at some point since the customer had arrived home that evening. It was intimated that if payment didn’t arrive soon, the customer would find the brick - and more like it - inside the vehicle at a later date. He made his final payment the next morning. A macho environment, then. A poor and tough upbringing, and then the motor trade - and yet my father is (and always was) a reader and a thinker. He’s by no means a quiet man, but I can’t recall a single sexist remark from him at any point. I suppose that that’s no surprise, given who he was married to (they’ve been divorced for more than twenty years, I might add). The relationship wouldn’t have lasted five minutes otherwise, and certainly not a couple of decades. I had positive contributions from both parents in regard to my view of women, despite society’s much more negative and insidious messages. My family situation was very broken for a long time, but overt misogyny or even sexism was not only impossible but patently ludicrous. All of the examples I saw were positive. I never really made the association between women and inferiority that seems to be at the core of most sexist attitudes. I had capable, impressive, admirable role models. I was fortunate. I mention occasionally that I’m a Star Trek fan. I’m one of those people who has seen every episode of every season of every series, multiple times, and who knows an enormous amount of trivia about the fictional universe; a real geek. I remember the controversy in 1995 when Star Trek: Voyager first aired. I was the same age as my mother was when she started her own business, and the issue on people’s minds was that the new starship had a female commanding officer. The need to integrate the (much smaller, non-Starfleet, and initially uncooperative) crew of another vessel that Voyager was sent to capture. Suddenly being cut off from everything that’s familiar, being tactically vulnerable, and being faced with a journey that will take a lifetime. How to balance the need to retain a command structure with the reality of now being a self-sufficient community. The challenges of maintaining Starfleet’s various principles of non-interference and peaceful exploration, whilst being overwhelmingly outnumbered and keen to expedite the journey home. 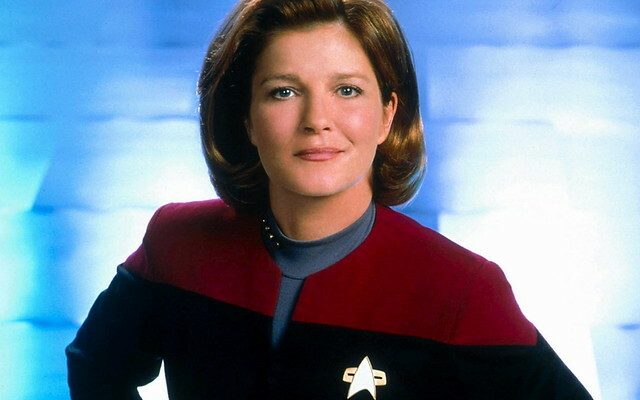 The character of Captain Janeway was a revelation to me. She was nuanced and believable, and addressed the ‘issue’ of being a woman by demonstrating that it just wasn’t an issue at all. She had femininity and compassion and vulnerability, and she also had an iron will, principles she defended at enormous cost, unquestioned authority, intelligence, nobility and courage. She wasn’t a character whose stereotypically female qualities had been exaggerated in order to simplify and compromise her, but nor were they ignored. Voyager’s last episode aired in 2001, and three years later I met my wife, another impressive woman. She’s a fellow software developer, and now manages a team of engineers. She’s been responsible for far, far more revenue than I ever will be - many millions of dollars. She’s strong and principled and capable. She’s also petite, and soft-spoken, and kind, and beautiful. She’s been known to cry at some of the more heart-wrenching Star Trek episodes. None of these qualities are in opposition to each other. I somehow manage to both grow a beard and cry (every time) when John Hannah’s character reads the poem in Four Weddings. I’d watch a romantic comedy over a football match any day of the week. I believe that my capability, intelligence and essential masculinity remain undiminished. I’m also learning - slowly - to lean on my wife, when I need to. We have a long way to go, as a society. We still attack women leaders on spurious grounds. We still apply double standards regarding how we view women, then judge them for it. My own industry, despite some progress, remains unwelcoming to women. Appallingly, there’s still a sick vein of outright hatred towards women, as recently publicised (Not Safe For Work / NSFW / Trigger Warning) regarding content on Facebook. Men still see women as being different from us, which they usually are, and we still think that those differences diminish women’s value or capabilities, which they don’t. We still fail to separate ‘different’ from ‘worse’. In doing so, we damage ourselves, because we must necessarily reduce ourselves to caricatures to underline the unimportant differences. I remain on a journey. My goal is to realise where my prejudices lie, to become aware of them, evaluate them through the eyes of adulthood, and attempt to redefine my views and correspondingly alter my behaviour. To reconstruct myself, so that I become what I want to be rather than what I was made to be. Some days I feel like I’ve made progress, and some days I make a backwards step. That’s normal. The key, I believe, is simply to continue. To try. Eventually, it will stick. Most of us are capable of re-evaluating our feelings and thoughts, and working out which ones are prejudices. By doing that, we can begin to reconstruct our ideas of what parts women can play in our shared society, and start to reverse millennia of repression, disrespect and under-utilisation. We can acknowledge differences and embrace them for what they are, by realising what they aren’t. We can accept that different levels of privilege call for different levels of encouragement, and that positive discrimination may well be part of the solution for the negative kind. We can learn to see the successes and achievements of women in the same way we do for men: the triumphs of fellow people, which edify all of us. Eventually, anyway. I’m still working on my part. Sieving my own prejudices is a journey I’ll probably always be on, and that’s the whole point. I’m not atoning for anything. I’m not writing this piece as a mea culpa, because I don’t think anyone benefits from that or even wants it to happen. I don’t think I’ve been particularly anti-women during my life. I consider myself to be a feminist2, and I think that any rational person should feel the same way. My shortcoming - like many men, I think - has been in awareness. Prejudices tend to be invisible to the bearer until explicitly pointed out (or until after some maturity sets in, perhaps). The challenge we face is developing the unnatural habit of checking what we’re thinking before we act upon it, and reassessing whether we should be thinking it at all. I’ll continue to work on that. Thankfully, I’ve been fortunate enough to have grown up in an environment (and a time) that allowed me to acknowledge that we have some way to go before our culture’s treatment of women corresponds to the reality of the women I know. I’ve been lucky to have strong, positive female role-models throughout my life, and indeed to be married to one. I’ve only been improved by it, as a person and especially as a man. Masculinity gets a lot easier when you give women the respect they deserve, and realise that our female role models are role models for all of us. I am a man. I have heroes. Some of them are women.